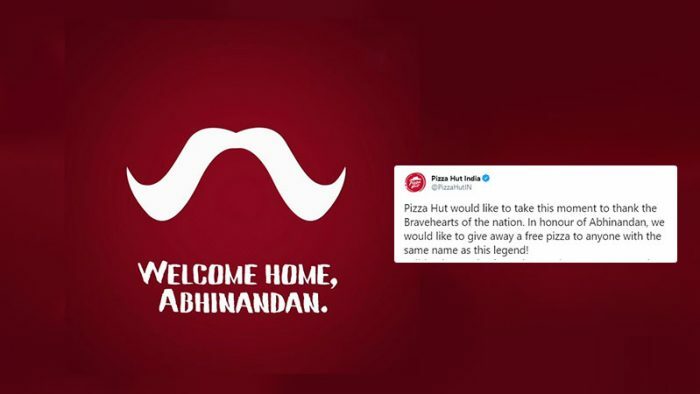 Pizza Hut’s latest creative, thanking the Bravehearts of the nation followed by a gesture of giving away a free pizza to anyone with the same name as Abhinandan is stirring backlash for touching a sensitive topic and using it for promotional activities. Pizza Hut would like to take this moment to thank the Bravehearts of the nation. In honour of Abhinandan, we would like to give away a free pizza to anyone with the same name as this legend! For the unacquainted Abhinandan Varthaman, a wing-commander in the Indian Air Force was held in captivity in Pakistan during the India-Pakistan standoff, after his aircraft was shot down in an aerial fight. While all the Abhinandans of the country are thanking them, one half of the audience sees this as an empathetic gesture, the other half sees it as opportunism on the brand’s path. I read pizza hut is offering Free Pan Pizza to people with name abhinandan. This is done to respect the bravery of Mr. abhinandan. I appreciate this idea, but what about those 40 crpf soldiers who got martyred. "Pizza Hut thanks the bravehearts of the nation. Walk-in now to your nearest Pizza Hut store T&C"@PizzaHutIN is this for real? I'm very confused if this is a hoax. Why not give discounts to actually armed force ppl?! If u really concerned then shut down the Pizza Hut Pakistan Business..
Shubhendu Jha, Head of Client Services & Co-Founder, NameWeBeeSocial on his LinkedIn post stated, “With due respect the to braveheart and all the heroes who keep us safe – I dont find this particular ad from Pizza Hut amusing. Cashing in on this particular person is not cool. Some of you might say this is their way of paying a tribute but I dont think our IAF hero should be used for an #instagram story ad which offers a freebie as a promotional offer”. The Masthead of Respect – saluting the new Indian woman in a true sense!